Michigan law defines a wetland as “land characterized by the presence of water at a frequency and duration sufficient to support, and that under normal circumstances does support, wetland vegetation or aquatic life, and is commonly referred to as a bog, swamp, or marsh.” In simpler terms, “wetland” describes an area where land and water meet. Wetlands are not always easy to spot. Places with a high ground water table—like meadows, fields, and forests—may also qualify as wetlands, even if no standing water is visible. Generally, wetlands are characterized by the presence of three factors: (1) water, (2) wetland soils, and (3) wetland vegetation. The presence of water above the soil or near the surface is merely the starting point for wetlands. Over time, increased water levels can lead to physical, chemical, and biological changes in the surrounding environment. High concentrations of water create hydric soil, or soil that no longer contains oxygen due to water saturation. In turn, wetland plants have special adaptations that allow them to thrive in the water-saturated soils. Wetlands are a vital part of Michigan’s natural resources. Many terrestrial and aquatic organisms call wetlands home, including rare, threatened, and endangered species. Wetlands provide nutrients in water food cycles. Additionally, wetlands are a source of valuable watersheds and ground water supplies. Wetlands also help control the negative effects of storms, floods, pollution, and erosion by absorbing water and filtering chemicals and silt. Finally, wetlands are popular locations for a variety of recreational activities, including hiking, bird watching, and hunting. Despite their inherent value, over half of Michigan’s wetlands have been drained or filled. In an effort to preserve these natural resources, restrictions and conditions have been placed on the use and development of wetland property. 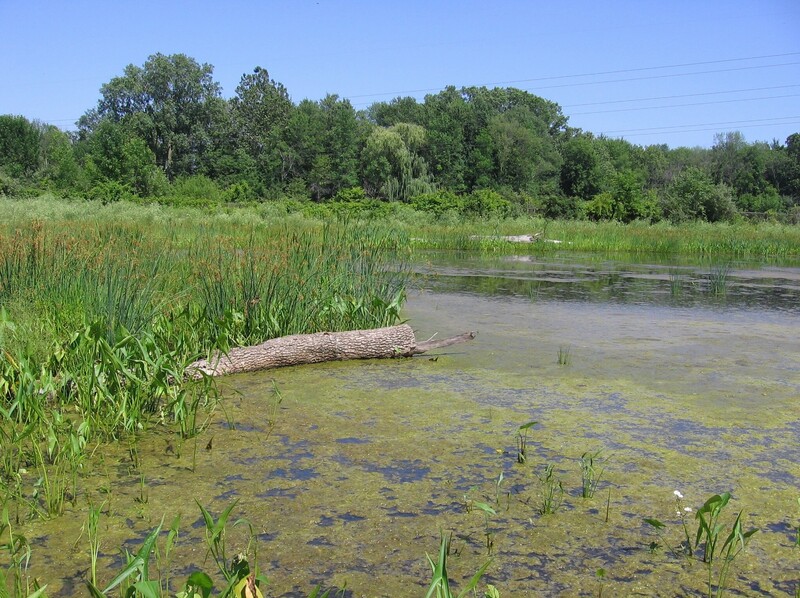 While the presence of water, wetland soils, and wetland vegetation are clear indicators of wetlands, an on-site inspection is the best way to determine whether wetlands are present. “Wetland” describes the area where land and water meet. Wetlands are not always easy to spot—places with a high ground water table (like meadows, fields, and forests) may qualify as wetlands, even if no standing water is visible. Wetlands reduce flood risk, improve water quality, and provide valuable habitats for many plant and animal species. What Are the Different Types of Wetlands? The four most common examples of wetlands are marshes, swamps, bogs, and fens. Marshes are found near streams, lakes, ponds, and rivers, and range from a few inches to a few feet deep. Swamps are home to water-tolerant trees or shrubs and contain saturated soils and standing water. Bogs are characterized by peat deposits, acidic waters, and a mossy floor, providing a habitat for numerous specially adapted organisms. Fens are similar to bogs, but are less acidic and have higher nutrient levels. The overall goal of wetland mitigation is to ensure that there is no net loss of wetlands. It is a means of offsetting unavoidable impacts to existing wetlands. A permit must be acquired before a wetland is drained or filled, and these permits are often conditioned on mitigation activities—normally the creation of new wetlands or the restoration of previously existing wetlands. Mitigation ratios describe how many acres of wetland must be created or restored for every acre of existing wetland impacted. How Are Mitigation Ratios Determined? A number of factors are considered to determine the appropriate ratio, such as the ecological type of the wetland and the proposed mitigation, whether the wetland being impacted is rare or imperiled, and the method of mitigation employed. Mitigation ratios can require as little as 1.5 acres of mitigation per acre of impact (1.5:1), to over 5 acres of mitigation per acre of impact (5:1). If a permit to use or develop wetlands is acquired after-the-fact, the ratio will be doubled. What Is Wetland Mitigation Banking? To facilitate compliance with permit requirements, “banks” of wetlands have been established in advance. Wetland mitigation banks offer “credits” that can be sold to applicants to satisfy permit conditions. Why Is Mitigation Banking Preferred? Mitigation banks are an effective alternative to traditional means of complying with wetland permit requirements, providing consistently available mitigation sites while reducing the necessary time and cost involved. Wetland mitigation banks often consolidate several small mitigation projects into larger, comprehensive projects, restoring wetland resources in an efficient and well-planned manner.